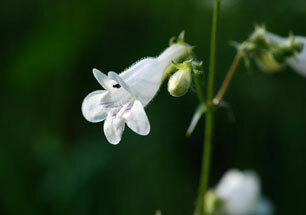 Also Called: Smooth beardtongue, smooth penstemon. Stems: Mostly erect, 1-3 stems, glabrous and shiny or somewhat waxy, often reddish near base. Leaves: Opposite, glabrous, entire to toothed; basal leaves lanceolate to ovate or spatulate, 1.2 to 8.8 inches long, .4 to 2.4 inches wide, tips pointed to blunt or rounded, stalked; stem leaves linear-lanceolate to ovate, 1 to 6.4 inches long, .4 to 2 inches wide, tips pointed, sessile to clasping; lower stem leaves often crowded and large; upper stem leaves widely spaced, much reduced. Inflorescences: Panicle, 3 to 13 inches long, with 2-6 whorl-like clusters, 3 to many-flowered; stalks much branched, ascending or spreading; branches covered with gland-tipped hairs during flowering; bracts usually much reduced. Flowers: Calyx 5-lobed, glandular-pubescent; lobes lance-ovate to ovate, 1/6 to 1/3 inch long, about 1/10 inch wide, pointed, margins rough; corolla slightly 2-lipped, .8 to 1.2 inch long, white, sometimes lined internally with faint reddish-purple lines, corolla throat abruptly inflated; lobes of upper lip 2, erect or ascending; lobes of lower lip 3, projecting; fertile stamens 4, in 2 sets; sterile stamen with recurved and flattened tip, sparsely bearded with whitish or yellowish hairs. Fruits: Capsule, egg-shaped, 1/3 to 3/5 inch long; seeds numerous, slightly rounded to angular, tan to dark brown. Habitat: Borders of woods, low open places in woods, prairies, meadows, fallow fields, and roadsides; loamy to sandy loam soil. Comments: The enlarged tube resembles the genus Digitalis, which is where the name originates.